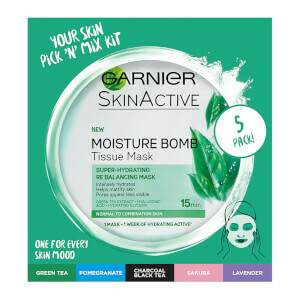 Treat dehydrated skin to the replenishing properties of the Garnier Moisture Bomb Pomegranate Hydrating Sheet Mask, a super-hydrating sheet mask inspired by Asian skincare. 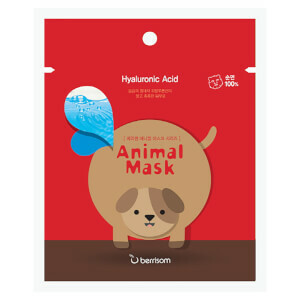 Super-hydrating and revitalising, the sheet mask is made from ultra-thin tissue and infused with a cocktail of Pomegranate extract, Hyaluronic Acid and plant serum (one mask contains the volume of half a bottle of serum*). Adhering comfortably like a second skin, the sheet mask creates a 'hydration wrap' on the face and continuously delivers beneficial ingredients into skin. Intensely rehydrating, the radiance-enhancing mask helps to reignite skin's luminosity while reducing the appearance of fine lines. Fresh and thirst-quenching, the mask will leave skin looking smoother and radiant in just 15 minutes. 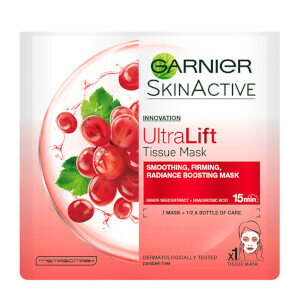 Contains 5 x Moisture Bomb Pomegranate Hydrating Sheet Masks. *Based on quantity of half a 30ml bottle. Desdobre a máscara. Aplique cuidadosamente o tecido branco na pele perfeitamente limpa. Certifique-se de que a película protetora azul está virada para fora. Alise a máscara delicadamente para garantir o contacto com a pele. Retire a película protetora. Ajuste os contornos da máscara ao rosto. Deixe atuar durante 15 minutos. Para retirar a máscara, puxe lentamente a partir das extremidades. Massaje suavemente o sérum em excesso ou use um disco de algodão para o remover. Aqua / Water, Propylene, Glycol, Glycerin, Alcohol, P-Anisic Acid, Dipotassium Glycyrrhizate, Glyceryl Acrylate/Acrylic Acid, Copolymer Hamamelis Virginiana Leaf Water / Witch Hazel Leaf Water, Hydroxyethylcellulose, Limonene, Mannose, Methylparaben,Peg-40 Hydrogenated Castor Oil, Phenoxyethanol, Potassium Hydroxide, Potassium Sorbate, Propylparaben, Punica Granatum Fruit Extract, Pvm/Ma Copolymer, Sodium Benzoate, Sodium Hyaluronate, Sorbic Acid, Sorbitol, Xanthan Gum, Parfum / Fragrance. (F.I.L. B184590/2).